Lenzing and The Woolmark Company announced a blending partnership between Tencel A100 and fine Merino wool. Knitwear is cool, the focus of designers, including stars Juun J the Korean Guest Designer, opening his show with very oversized chunky cream garments. The trend noted in the earlier shows towards high value, luxury textiles has increased the amount of cashmere, and other noble fibres. Premiere Vision in Paris this September showed the importance of knit in all sorts of different weights and designs for AW 2016/17. Filo Milan Autumn/Winter 2016/17 showed clear trends and many different yarns for winter and trans-seasonal use, Janet Prescott reports. Premiere Vision Paris was introduced for the first time rebranded into five different sections, which works great for navigation, according to our expert Janet Prescott. Many colours for spring 2016, as seen at Filo, are delicate, a little pale and interesting in the way they are put together, Janet Prescott reports from Milan. Tencel capacity has been expanded hugely with the coming on stream of the state of the art giant production plant for Lyocell fabrics. 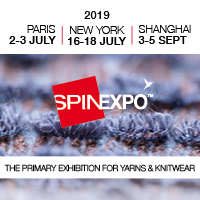 Premiere Vision Paris has further underlined the importance of knitted fabrics and developments in yarns for the Autumn/Winter 2015-16, according to our knitwear expert Janet Prescott.